The following article was written by Anastasia Gonis for the April 15 2013 edition of Buzz Words Issue 151. The article is reproduced on my blog with Anastasia's kind permission. Thank you, Anastasia. Robyn Opie Parnell is an Australian children’s book author, screenplay writer, and a generous heart with a vision to becoming so much more. She has published 88 books since she began writing. “When I was fifteen, my English teacher gave me an A for every essay I wrote. One day, as he handed me back an essay, he said, ‘You should be a writer.’ At the time, I hadn’t given any thought to people writing books. I only thought about the characters and the stories. Thanks to my English teacher I realized I, too, could write a book. So I did! “Unfortunately, the first book I wrote at fifteen wasn’t suitable for publication. 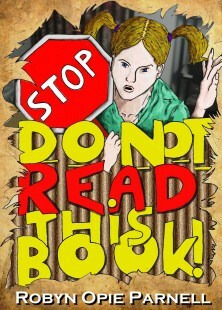 My main character was too similar to the super-sleuth Nancy Drew. I was a big fan of the Hardy Boys and Nancy Drew when I was growing up. In my early twenties, I tried to get a story published but I had no idea that illustrated books of 2,500 words were difficult to get published. Picture books are usually less than 700 words. I knew nothing about the publishing industry and I had a lot to learn. Robyn believes this course was the turning point for her. “I knew I was ready to submit to publishers, thanks to Elizabeth’s help and feedback. I also joined a writers’ group and formed one of my own. My first children’s books were published in 1999. Robyn worked with Era Publications from 2001 to 2009 with her first books published by Era in 2002. In March 2011, she terminated her publishing agreements with Era after a dispute about the assignment of rights. Robyn believes in exploring all avenues for her work. She has even submitted a story to Hollywood producer Wolfgang Petersen for consideration as a family movie, and a screenplay to an Australian producer. But it’s at children’s books that she excelled. She elaborates. “I wrote a story with my husband, Rob, that I believed would make a great Hollywood movie. Rob put together a proposal, which we then sent to Wolfgang Petersen. Why not? Wolfgang Petersen might be a famous movie producer but he’s also a businessman looking for good projects. And we believed we had a good project. “A week after we sent our proposal, I received an email from Wolfgang’s Creative Executive. We signed a release form so that Wolfgang could consider our proposal. Approximately four weeks later, we received a phone call. While everyone agreed that our project would make a great movie, Wolfgang had decided not to make three disaster movies in a row. Alas! How easy/difficult was it for Robyn and Rob to write a screenplay? Things seemed to fall in place for Robyn once she began writing. Even submitting her work to mainstream publishers went without a hitch due to networking. “All of my books have been published one way or another as a result of networking. For example, I found out about Barrie Publishing’s call for submissions from another member of a writers’ group I attended. Once I had the publishing credits with Macmillan Education, other publishers were willing to accept my unsolicited submissions. “I wrote a story called The Pony Game, which was based on my childhood experiences. I researched the Giggles series and discovered that Lothian Books didn’t have a pony story in its Giggles series. When I attended the Children’s Book Council of Australia conference in Sydney, I approached Helen Chamberlin and asked if I could submit a story to Lothian Books, despite the fact that its website stated ‘no unsolicited submissions’. Helen was pleased to receive my submission. Three months later, The Pony Game was accepted. But mainstream publishing has definitely changed over time. Robyn tells us about these shifts in publishing. “Publishers have changed the way they accept submissions. Some are now only accepting submissions via an email query or pitch. ABC Books request an appraisal from a reputable manuscript assessment agency. Penguin Australia will only look at one type of book each month. September is picture book month. A proportion of publishers only accept submissions sent via a literary agent. Overall, a writer’s ability to submit to publishers has been curtailed by the much tighter, more restrictive submission guidelines. “The other difference is in publisher response time, which has obviously led to the tighter, restrictive submission guidelines. When I submitted Maya and the Crystal Skull, I waited 7 months for one publisher to respond and 12 months for two others to respond. 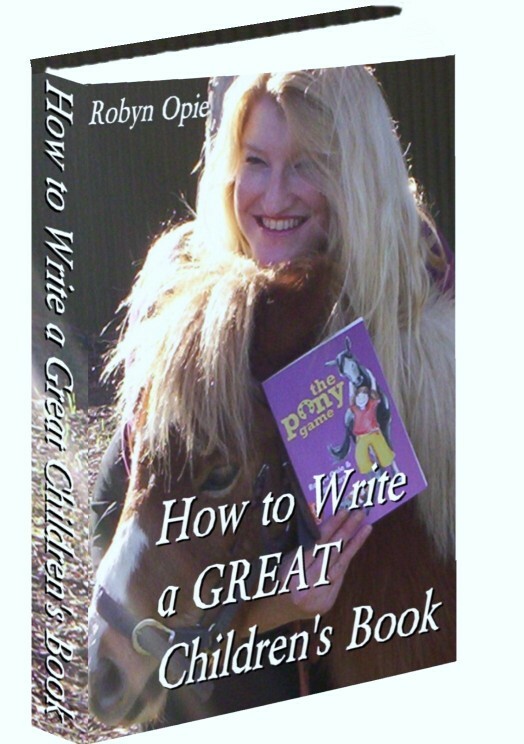 Robyn’s books now are mostly Self Published. She explains how and why she chose this path, considering the time-consuming tasks such as marketing and promotion which she has had to include in her work load. “My husband, Rob, has been publishing books since about 2005. He has wanted to publish my books for a long time but I’ve resisted. I didn’t want to do the extra work I was used to publishers doing, such as proofing, design, distributing and marketing. After waiting 7 and 12 months to hear from publishers about my novel Maya and the Crystal Skull, I had a change of heart. I’m a psychic medium who communicates with spirit guides. (More on this in a moment) Through consultation with my spirit guides, I realized that self-publishing was my destiny. “Marketing and promotion is always the difficult part when publishing one’s own books, for it is time-consuming work for an author when all they want to do is get on with their writing. Nowadays, it seems to be a necessary evil. The real-world stuff isn’t as much fun as my fiction. In Backstage Betrayal, Robyn covers themes of envy and jealousy, and in Our Secret Place she explores the repercussions of one’s actions, loyalty and friendships. 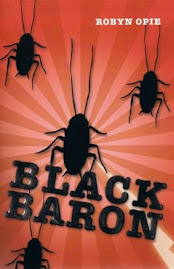 In Black Baron, published by Walker Books, Robyn builds an exciting adventure around a racing cockroach and a race to save his life. Eye of the Future is about a girl with the gift of second sight. Robyn, too, has a special gift. I ask her if she would share the other side to Robyn Opie Parnell, the writer, with us. She is more than willing to oblige. “In 2005, I became interested in psychic mediums. I watched TV shows and read books to learn more about this amazing field. After a ‘chance’ recommendation, I also went to see a psychic medium for the first time. What a life-changing experience! My fascination with psychic mediums continued. “In September 2010, after watching Tony Stockwell’s Psychic Academy on Foxtel, I bought a pendulum and began using it on a daily basis to communicate with my spirit guide. Around this time, I also began meditating every day. In November 2010, while having afternoon tea with a friend, I had my first experience as a medium. I saw the spirit of my friend’s deceased husband. 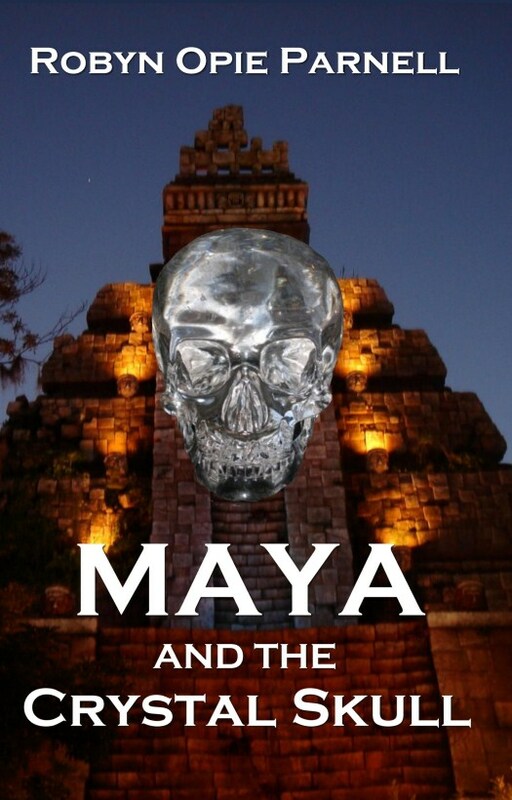 · Maya and the Crystal Skull, the superb first book in a fantastic series. It is a thrilling paranormal adventure, set around the Mayan civilization, its ancient laws and the spirit world. This has an interesting and diverse selection of themes and subjects. The sequel, Maya and the Daring Heist, will be available in May 2013. The wonderful Maya series is riveting reading, full of intrigue, adventure, and betrayal. But are there additional books planned for the series? Readers certainly hope so! We are put at ease when Robyn confesses that she is forced to write a third book due to the open-ended winding up of Book Two, despite the preparation for the paperback production of her two e-books and so much more in the pipeline. “Maya and the Daring Heist ends on a cliff-hanger, which puts me under pressure. I have to write a third book in the series, even though I have no idea what that story will entail at this point in time. I trust my spiritual guidance, so I took the plunge and left the story open for a third instalment. A writing life incorporates more than books for Robyn. She also runs writing classes based on her How to Write a GREAT Children’s Book. But what other services does she offer? Robyn is also a generous supporter of many charities through her websites. The environment, nature, animals and spiritual living are extremely important to her. She shares her vision with us. “Besides writing, my passions include animals and nature. I believe it’s important for all of us to spend time in nature, so we can ground ourselves. One of my favorite experiences was going to the Singapore Zoo at night. Sitting with my husband watching the giraffes at eleven-thirty at night was one of the most peaceful and memorable experiences of my life. Our world is a beautiful place with so much breath-taking scenery and totally amazing animals. “It’s been a dream of mine for a long time to be able to donate large sums of money to charities. I want to make a difference. Animals can’t speak out for themselves. They are at our mercy. One of the reasons I write and want to be successful is so I can donate money to charities. When I’m old and grey, sitting in my rocking chair on my front porch, I want to look back at my life and know that I made a positive impact on the world. As always, I ask what advice Robyn would offer to anyone dreaming of a career in children’s books. “Run! Just kidding! In my early twenties, when I submitted my first manuscripts to publishers, I didn’t know about word counts, age groups, types of books or anything else to do with children’s books/publishing. My first manuscripts were rejected. My advice, based on my own experience, is to learn everything you can about writing, especially about your chosen genre. After all, you wouldn’t think of piloting a jumbo jet without first learning how to fly. Buzz Words is a fortnightly e-zine designed specifically to cater for the needs and interests of children’s writers, illustrators, librarians, teachers, editors and lovers of children’s books. It features interviews with editors, authors, illustrators, agents, booksellers and publicists as well as valuable information on the children’s book community in Australia and internationally including writing markets, opportunities, competitions, courses, conferences and book reviews. And it's delivered straight into your in-box. CLICK HERE for more information about Buzz Words.